South Africa is hosting this year’s World Cup, but do you know which other African nations will be represented? There will be six African teams participating in this year’s World Cup. 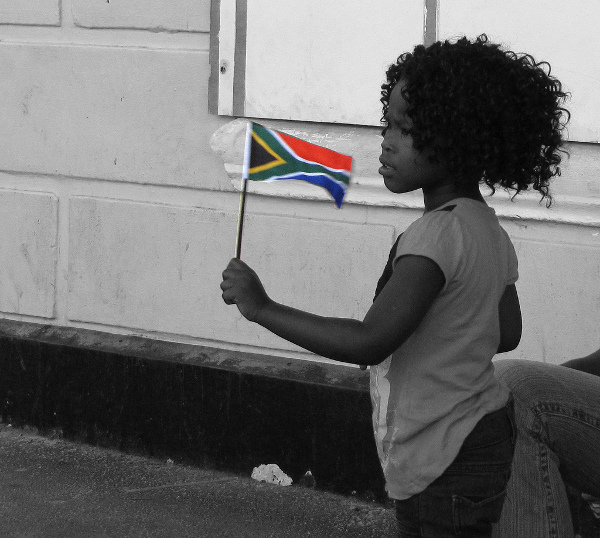 The first, South Africa, qualified automatically as the host nation. The other five – Algeria, Cameroon, Nigeria, Ghana, and Ivory Coast – came through the qualifying rounds to fill the continent’s usual spots. While they’ve produced many talented players, African nations have a history of underachieving at the World Cup. So far, no African team has ever advanced past the quarterfinals. Since this year’s World Cup is the first ever to be played on African soil, there will be more supporters of African nations at the games and more pressure on African teams to win. As the host nation, South Africa didn’t have to go through the normal qualifying process and is the lowest-ranked African nation playing this year’s World Cup (90th in the FIFA world rankings). Some fear that South Africa might become the first World Cup host nation not to make it out of the group stage. The team did play moderately well in the 2009 Confederations Cup, where they reached the second round before losing to Brazil. Among ‘Bafana Bafana’s’ more prominent players are Steven Pienaar, who plays for Everton, and forward Benni McCarthy, of West Ham United. Most of the squad plays in South Africa’s domestic league. The team is in Group A with France, Mexico, and Uruguay. 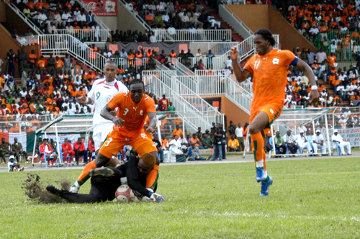 Ivory Coast team consists of star players like current African Footballer of the Year Didier Drogba, Arsenal defender Emmanuel Eboué, Manchester City defender Kolo Toure, and Barcelona midfielder Yaya Toure. On the roster, this is probably Africa’s most talented team. Despite its immense talent, the team has a reputation for reacting badly to pressure. They’re also working with a new coach, former England coach Sven Goran-Eriksson, who they brought back in March. A change like this, especially this close to the World Cup, could affect the team. Ivory Coast also had the misfortune to be drawn in the difficult Group G with Brazil, Portugal, and North Korea. Ghana may be Africa’s best bet to win at this World Cup. The ‘Black Stars’ have a strong team of players like Chelsea midfielder Michael Essien and Inter Milan midfielder Sulley Muntari. They’re coming off of a very good Cup of Nations, having reached the final before losing to the Egyptian team. They also seem to have a stronger and more unified team than Ivory Coast. While Ghana reached the second round of the 2006 World Cup, they’re in a tough group this time, and will have to stay sharp if they want to move on. The team will play in Group D with Australia, Serbia, and Germany. Known as the ‘Super Eagles,’ the Nigerian team is solid at defense and midfield but has been floundering when it comes to scoring goals. Despite reaching the semifinals and finishing third at the Cup of Nations, Nigeria fired its coach in February. Former Swedish coach Lars Lagerbäck will now lead the team in the World Cup. Nigeria’s big names include Chelsea midfielder John Obi Mikel, Wolfburg forward Obafemi Martins, and captain Nwankwo Kanu, who plays for Portsmouth. They are in Group B with Argentina, South Korea, and Greece. Cameroon’s ‘Indomitable Lions’ were the first African team to reach a World Cup quarterfinal in 1990. They haven’t managed to repeat this success since, but have still qualified for four of the past five World Cups. The team has one of the world’s best forwards, Samuel Eto’o, who currently plays for Inter Milan. Long-time defender Rigobert Song is also likely to appear, though perhaps in a more limited role. Cameroon is in Group E alongside the Netherlands, Denmark, and Japan. Algeria is the only North African nation at this World Cup. The team qualified at the last minute, winning a series with Egypt after the two countries finished even in their group. Algeria’s players aren’t household names, but many play for clubs around Europe and have experience with top-level competition. Glasgow Rangers defender Madjid Bougherra is probably the team’s most well-known player. Most of the attention in Algeria’s group will be focused on England and the US, and Algeria isn’t widely expected to advance. Still, the team came in fourth at the Cup of Nations, so they shouldn’t be underestimated. Algeria is in Group C with England, the US, and Slovenia. What team do you think has the best chance of winning the World Cup? Will this finally be Africa’s year? Red Hot and Riot: Fela Kuti Lives!